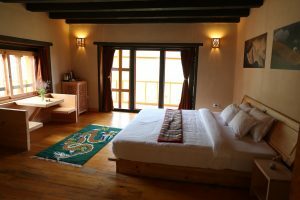 Wangdue Eco-lodge was started in 2015 and it is the first of its kind in Bhutan started by Ugyen Wangchuk, a veteran professional tour guide and a passionate photographer. The main goal of the proprietor has been to have a sustainable approach with the services they provide so that the travel and tourism activities in the country have a lesser impact on the environment and the community. Owing to which the lodge makes use of the energy saving light bulbs and equipment, and they also have a good waste recycle management practice in place. The Eco-lodge has four cottages, a service building and a traditional farm house built with ecofriendly materials. The cottages overlook the beautiful Ngashigaykha village and the majestic Wangduephodrang dzong. 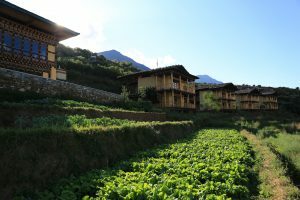 Some of the remarkable activities and experience that Wangdue Eco-lodge provides is seasonal agriculture activities such as cultivating and plantation with local people, adventurous nature hikes and cultural hikes to landmarks, playing archery and other traditional games and the unique of all learning to cook authentic Bhutanese cuisines from the experts. On the whole it is an experience that will bring you closer to nature and the Bhutanese culture. To know more about Wangdue Eco-lodge visit their website www.bhutanecolodge.com or write to them at wangdueecolodge@gmail.com. You can also call them at 17353004 /17111783.